What better way to spend a sunny weekend in London than wandering around the marina style streets of Bermondsey? Here’s my review of Maltby Street Market. Hidden in the tiny Rope Walk just off Bermondsey High Street, the Maltby Street Market is a crowded little alley within walking distance from Tower Bridge with plenty of foodie treats on offer. Looking for a guilty pleasure? Head to Little Bird Gin‘s pop up bar and try the gin distilled in small batches using grapefruit and orange to give it a smoother, more rounded, fresh taste. The bar also sells spicy Bloody Marys, classic Negronis and G&Ts. Trying to move past a hangover? My personal favourite cure are The Cheese Truck‘s grilled cheese sandwiches, damn fine treats made with fresh Pagnotta sourdough and British farmhouse cheeses. Or you could have a Bad Brownie, the creation of two creatives who dropped agency work for the love of decadent, chocolatey brownies. If this is not enough, you can always go for a special Lick froyo with pop corn and salted caramel, or for an ice cream sandwich by Milo & Hector. Not far from Maltby Street is the lovely Bermondsey, the perfect place for a stroll and just a bus ride away from my now favourite summer destination, Frank’s Café and Campari bar, where I finished my day out with a pint of lager and the inevitable hummous with pitta. Food, drinks and a view. What else? Quale modo migliore di passare il weekend più caldo dell’anno se non passeggiare per le strade del quartiere di Bermondsey? 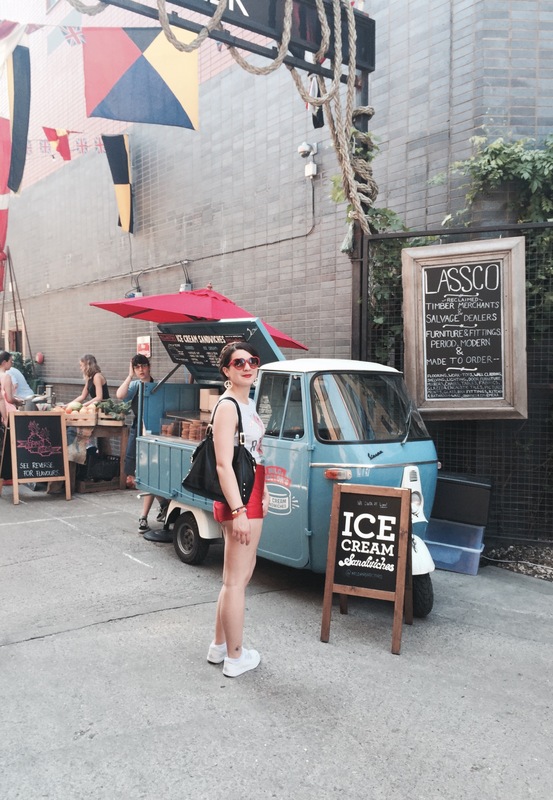 Eccovi la mia recensione di Maltby Street Market. Nascosto nella piccola via di Rope Walk a pochi passi da Bermondsey High Street, il Maltby Street Market è una viuzza affollata a pochi minuti da Tower Bridge con una serie di delizie che vi lasceranno l’imbarazzo della scelta. Se siete in cerca di un drink, fate un salto al pop up bar di Little Bird Gin e provate il gin distillato con pompelmo e arancia per dargli un gusto più fresco e liscio. Little Bird vende anche Bloody Mary piccanti, Gin e Tonic e Negroni. Se state combattendo la sbronza, la mia cura preferita sono i toast al formaggio grigliato di The Cheese Truck. Altrimenti potreste concedervi un Bad Brownie, la creazione di due pubblicitari che hanno lasciato il lavoro d’ufficio per amore del cioccolato. Se tutto ciò non è abbastanza c’è sempre il frozen yogurt di Lick, che questa settimana vendeva la ricetta speciale con pop corn e caramello, o i panini al gelato diMilo & Hector. Non lontano da Maltby Street c’è Bermondsey, che sembra quasi una città marinara, il posto perfetto per una passeggiata al sole. Bermondsey è a portata di autobus se, come me, la vostra tappa successiva è il fantastico Frank’s Café and Campari bar, dove ho finito la mia giornata con una pinta di lager, hummous e pitta. Cibo, viste fantastiche e un drink. What else?